The pneumococcal disease immunization schedule for adults in the United States is relatively complex. Two types of pneumococcal vaccines are to be administered in a variety of combinations and at different intervals based on a patient’s age (younger than 65 years vs aged 65 years and older), underlying risk conditions, and pneumococcal vaccination history. Vaccine recommendations such as those for influenza require only one dose of vaccine to be administered to every U.S. adult every year. Little effort is required by clinicians beyond checking for serious adverse reactions to past doses, which are extremely rare. For pneumococcal disease, the vaccine recommendations are less straightforward. The adult pneumococcal recommendations from the CDC Advisory Committee on Immunization Practices (ACIP) may seem complex to busy healthcare professionals and their patients. For example, whereas ACIP carefully differentiates recommendations for those with “chronic conditions” versus “immunocompromising conditions,” clinicians may not distinguish between these categories with their patients. The National Foundation for Infectious Diseases (NFID) is dedicated to educating healthcare professionals and the public about the burden of vaccine-preventable diseases and the importance of vaccinating according to ACIP recommendations. To promote widespread education about vaccines, NFID created a dedicated webpage with pneumococcal vaccination resources for healthcare professionals. 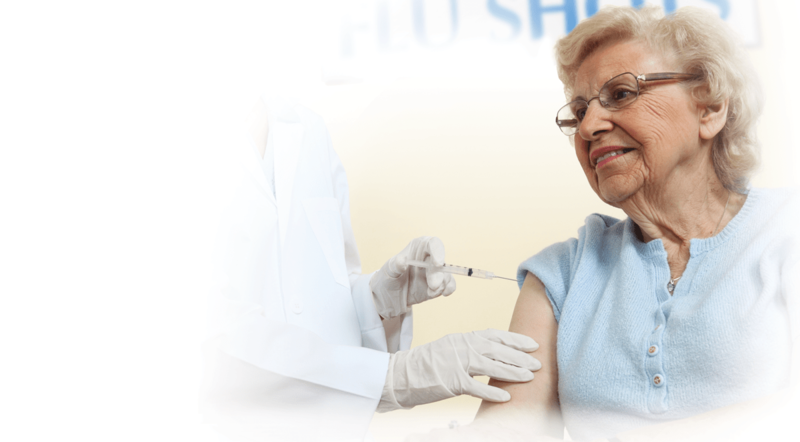 The NFID Pneumococcal Vaccination Resources page (http://www.adultvaccination.org/professional-resources/pneumo) includes a variety of fact sheets, templates, and assessment tools. Of key importance is the guidance provided on vaccinating higher-risk adults who are younger than 65 years (Table). 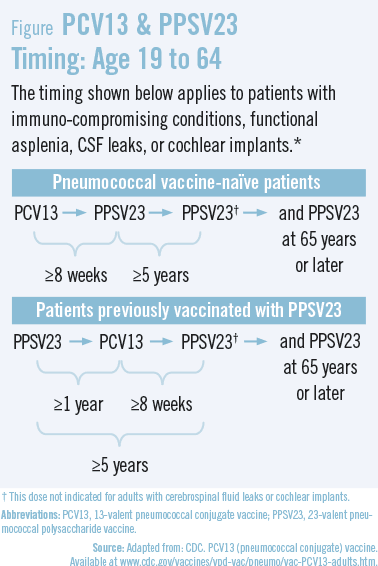 Whereas most patients who need the 13-valent pneumococcal conjugate vaccine (PCV13) and the 23-valent pneumococcal polysaccharide vaccine (PPSV23) also require a second PPSV23 dose at least 5 years after the first doses, guidance is also provided for two groups who do not need the PPSV23 revaccination, and for those patients who are indicated for PPSV23 only. Also notable is the guidance provided on vaccination of all adults aged 65 years and older (Figure). Guidance is provided for patients who are vaccine-naïve as well as those who previously received PPSV23. Together PCV13 and PPSV23 provide layers of protection against pneumonia, meningitis, and bacteremia, as well as other less serious manifestations of pneumococcal disease. Understanding and implementing complex recommendations takes time, but the efforts help ensure patient health. The infections that lead patients to infectious disease-related care are varied, and the interventions that might have prevented them are not always clear. However, considering the availability of safe and effective vaccines, every effort should be made to help patients avoid vaccine-preventable disease. The complexity of the pneumococcal recommendations should not deter clinicians from advising patients appropriately. Pneumococcal disease causes more than 1 million cases of pneumonia in the U.S. annually. The case-fatality rate is 5% to 7% and may be higher than 50% in older adults. Whereas the incidence of other clinical manifestations of pneumococcal disease—such as meningitis and bacteremia—is much lower, these manifestations are potentially deadly across all ages. Historically, pneumococcal vaccination coverage rates have been low. Prior to the availability of PCV13, the pneumococcal vaccine coverage rate for patients aged 65 years and older was about 60%. Coverage was only 21% for adults aged 19 to 64 years who were at risk for severe pneumococcal infection because of factors such as asthma, smoking, chronic disease, or other immunocompromising conditions. Adding PCV13 to PPSV23 provides an additional layer of protection for many patients, but only if these vaccines make their way into our patients’ arms. One of the most effective methods for ensuring vaccination is for all clinicians to strongly recommend it. Patients in multiple studies have referenced their healthcare provider’s recommendation as the most important factor in their decision to get vaccinated. The National Vaccine Advisory Committee Standards for Adult Immunization Practice urge clinicians to avoid missed vaccine opportunities. This includes knowing which vaccines can be administered in the same visit and making sure all are strongly recommended and offered to patients. CDC. Pneumococcal disease: clinical features. Available at http://cdc.gov/pneumococcal/clinicians/clinical-features.html. CDC. Use of 13-valent pneumococcal conjugate vaccine and 23-valent pneumococcal polysaccharide vaccine for adults with immunocompromising conditions: recommendations of the Advisory Committee on Immunization Practices (ACIP). MMWR Morb Mortal Wkly Rep. 2012;61:816-819. CDC. Advisory Committee on Immunization Practices recommended immunization schedule for adults 19 years or older – United States, 2015. MMWR Morb Mortal Wkly Rep. 2015;64:91-92. Department of Health and Human Services. Update on the National Vaccine Advisory Committee standards for adult immunization practice. Available www.hhs.gov/nvpo/nvac/reports/nvacstandards.pdf. National Foundation for Infectious Diseases. Call to Action: Preventing Pneumococcal Disease in US Adults with Chronic Conditions. January 2015. Available www.adultvaccination.org/professional-resources/pneumo/cta-chronic-conditions.pdf. Tomczyk S, Bennett N, Stoecker C, et al. Use of 13-valent pneumococcal conjugate vaccine and 23-valent pneumococcal polysaccharide vaccine among adults aged ≥65 years: recommendations of the Advisory Committee on Immunization Practices (ACIP). MMWR Morb Mortal Wkly Rep. 2014;63:822-825. Williams W, Lu P-J, O’Halloran A, et al. Vaccination coverage among adults, excluding influenza vaccination—United States, 2013. MMWR Morb Mortal Wkly Rep. 2015;64:95-102. Susan J. Rehm, MD, has indicated to Physician’s Weekly that she has served on advisory boards for Pfizer Inc. and Merck & Co. Inc.